People don’t like to wait, for anything. We want things instantly. Translation between languages has always been a manual task. An iPhone app called Word Lens from Quest Visual aims to make the process instant, and as with most things instant, the results aren’t exactly as good. Word Lens uses the camera in your iPhone to capture text and in real-time translates the text to a different language on the screen, before your very eyes. To get the results however, there are some limitations, which make this instant dream, a little far from being reality. The app currently supports translating between English to Spanish, and Spanish to English. Support for languages are said to be on the way, though we haven’t seen anything so far. The app is free to download, but you can’t actually do anything with it until you pay for the language packs via in-app purchases. Right now you have to pay $9.99 for Spanish to English and again $9.99 for the English to Spanish functionality. I tested out the Spanish to English pack. After seeing the video demo of the app, I was excited and wanted to try out Word Lens during my last trip. I mean what better way to find out what a Spanish phrase means that to just read it in English. What doesn’t seem so obvious in the videos is the fact that the text used is both printed and is quite large. It is also not surrounded by any other text and uses generic fonts. Let me say that first of all, the app does work, for words printed using very large, with a clear background free of any other text. Basically, think signs. If you try it on say a newspaper, magazine, website, business card, or anything else your results will dramatically suffer. When it does work, it is actually pretty amazing, to see the letters in Spanish words literally come to life as they sort of flip around forming their translation in English. But when it doesn’t work, it gets to be pretty annoying. – For use with non-printed material, on a TV or monitor. 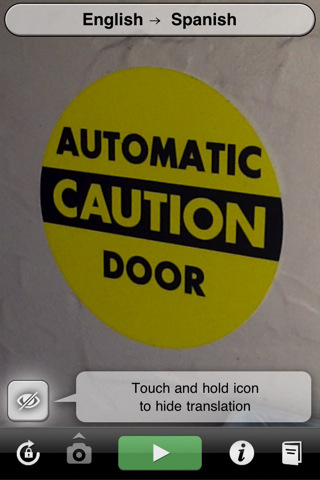 Overall, Word Lens is a great idea, almost to the point that the idea itself makes people want to buy the app. The app works universally on both then iPhone and iPad. 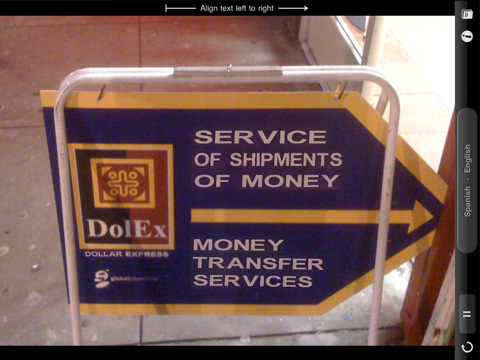 The buzz around instant visual translation is enough to draw customers in to see if it works. For practical day to day use however, it has a ways to go still. For now I would recommend you save your money. Unless you really want that instant gratification, even if it means with less fillin. AppSafari review of Word Lens was written by Joe Seifi on March 25th, 2011 and categorized under App Store, Travel, Utilities. Page viewed 4281 times, 4 so far today. Need help on using these apps? Please read the Help Page.